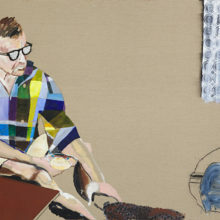 Having previously spent over a decade within an educational and institutional setting, studying at the University of Melbourne (2000), Chelsea School of Art and Design (2006), completing his Masters at the Victorian College of the Arts (2008) and working across Europe as a studio assistant and intern. It was the Marten Bequest Travelling Scholarship (2008), which afforded him the opportunity to spend time away from formal education. This launched a shift in his practice, away from the Postmodern and towards something more personal. 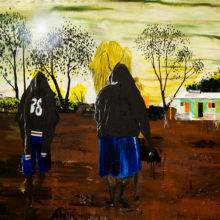 Mackinnon began the two-year Marten Bequest Travelling Scholarship, by spending twelve months in the Kimberley region of Western Australia firstly as artist in residence at Mangkaja Arts, Fitzroy Crossing. In 2010 he moved to Central Australia working as a field officer for Papunya Tula Artists, an Indigenous owned artist cooperative. Before this time, Mackinnon was working, learning, collecting, growing up, building an extensive language and refining his skill. An outward search looking in, using his own life, culture and experience as the ingredients. Keen to explore and experience a wider Australia, Mackinnon began this self-directed time with senior Indigenous artists to further an understanding and appreciation of Country and culture. Feeling the liberation from an institutional environment, Mackinnon worked closely with senior Indigenous artists as an assistant. Under the guidance of mentors, he began to discover his own visual language, digesting the previous decade whilst developing an understanding of a broader history of painting and spiritual significance. 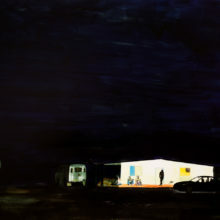 From this point with the facility of techniques he had honed over the previous decade Mackinnon started painting his surrounds; rubbish bins, power points, sprinklers and cars, all now holding a symbolic power. Objects from life suddenly took on an emotional range or atmosphere, becoming characters that were able to communicate some of what he was feeling and experiencing. Reconnecting with lessons lived with for a decade, continuing to inform Mackinnon’s language, distilling his method and psychological process. Living abroad for a number of years has played a significant role in the process. Mackinnon continues to draw on these formative experiences like a muscle memory, bringing with it a sense of nostalgia and substance. His honed skills retrace and recall this intense period, drawing on gathered life experience, he offers new perspectives as the memories intersect. 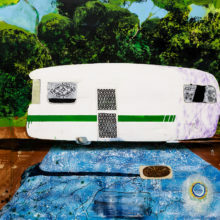 An extension of his education, not merely autobiographical, Mackinnon considers the personal viewpoint of his paintings to connect with universally shared and lived experiences.